We live in a corporate environment where time is scarce and employees are trying to balance their career and outside interests (e.g. family, personal hobbies, health, etc). Because of this, most people simply go to their job and don’t really want to participate in any innovation sessions or activities that may require time above and beyond what is required. They view innovation as yet another objective added to the already long list of whats expected of them in their daily work routine. One way companies address approaches to innovation, is by conducting innovation sessions. Most likely innovation sessions have participants from the company who get together and through use of a facilitator, perform different activities to generate ideas. In a perfect world, every employee within a company would be excited to attend such a session, and would be full of ideas. However, the reality is companies tend to invite people regardless of their interest or abilities, and so as a result, we have to deal with people who are not engaged, not innovative, or have simply been invited because they funded the event. How can we then motivate those who are not engaged in the innovation session and don’t particularly care to be there? Typically innovation sessions have reward(s) planned at certain stages when either a team or individual completes some milestone or is perceived to be a large contributor of ideas. Why? Well, many (if not all) of us at some time or another received an incentive to complete a task. Therefore, it is only logical that everyone will be motivated to be innovative if there was a reward, right? Although there is evidence to support that rewarding certain behavior each time it is observed will increase the frequency of that behavior, this is a very general conclusion and does not take into account peoples internal thoughts about themselves, their self-perspective, and motivation to behave in a certain way. Generally, motivation can be either intrinsic or extrinsic. Intrinsic motivations are those that arise from within – doing something because you want to – while extrinsic motivations mean people are seeking a reward, such as money, a good grade in class, or a trophy at a sporting event. According to self-perception theory (SPT), replacing intrinsic motivation with extrinsic motivation may actually make people enjoy the activity less or loose interest altogether. This is due to what has been termed the overjustification effect, which results when people begin to view their behavior as being caused by rewards instead of realizing the extent intrinsic motivation actually played. Psychologist Daryl Bem, developer of SPT, conducted an experiment where subjects listened to a tape of a man enthusiastically describing a tedious peg-turning task. Some of the subjects were informed the man was paid $20 for his testimonial while another group was told he was paid $1. Those who were in the group informed that the man was only paid $1 felt as though he must have thoroughly enjoyed the task. This is in contrast with the other group who felt the exact opposite. Considering motivation from the Industrial-Organizational (I-O) Psychology approach, it becomes something a bit complex, but at the same time provides some valuable insight into how we can motivate and engage more employees in innovation – which is the ultimate goal for the Osmotic Innovator. Maslows Hierarchy of Needs essentially states we have different levels of needs that must be sequentially fulfilled before we can reach self actualization (the desire of a person to develop their capacities to the fullest). Although this has become the most popular way to think about motivation, there has been little research performed to test this theory, and the research that has been performed is not completely supportive. There soon emerged a new approach to understand motivation and with this came Vrooms VIE Theory which was placed into a new category termed “Person-As-Godlike: The Scientist Model”. Using Maslows Hierarchy of Needs as a base, VIE (Valence, Instrumentality, Expectancy) theory provides a definition for each component. Valence identifies how psychological objects in an environment have an attracting and repelling force. 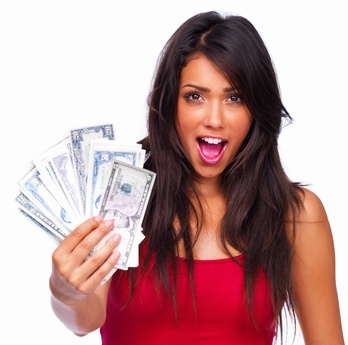 For example, most would find money attracting and uninteresting work as repelling. Instrumentality deals with the relationship between performance and expected outcomes. An example provided by Frank J. Landy and Jeffrey M. Conte is that of a promotion. Usually a promotion means a higher salary and more prestige, but it may also include more responsibility and longer hours. Once a person is aware of these instrumentalities (essentially Pros and Cons), they can better decide which outcome is better. Lastly, expectancy is defined through this theory as the individuals belief that increased effort leads to successful performance. Inform employees what benefits may arise from their increased innovation. Explain how things like increased company exposure and the ability to work on their own project all may stem from an increasingly innovative environment. Provide small incremental incentives during innovation sessions to those who are perceived to be completely unmotivated. It has been shown that providing incentives to those who completely lack the intrinsic motivation for something can not hurt – it can only potentially help for the duration of the event. Know your audience. Begin to meet with those who seem to be lacking motivation and talk to them. You will be amazed at what information you can gain and leverage to get them motivated. Highlight how any contributions they make toward promoting a better innovative environment is valued. Maybe even make them in charge of proposing (and possibly implementing) how a more innovative and positive work environment can be accomplished. These are just a few suggestions that can be quickly and easily tried by any organization. Remember, motivation is a complex topic and there is really no “one size fits all” approach. Even today, there are debates within the Psychology community regarding the validity of some motivational theories. Hopefully by implementing some of the suggestions above (and maybe even coming up with a few of your own), the innovative culture can begin to become infectious and slowly have a positive effect on everyone around. Aronson, Elliot, Timothy D. Wilson, and Robin M. Akert. Social Psychology. 7th Ed. NJ: Prentice Hall, 2010. Aronson, Elliot. The Social Animal. 10th Ed. New York: Worth Publishers, 2008. 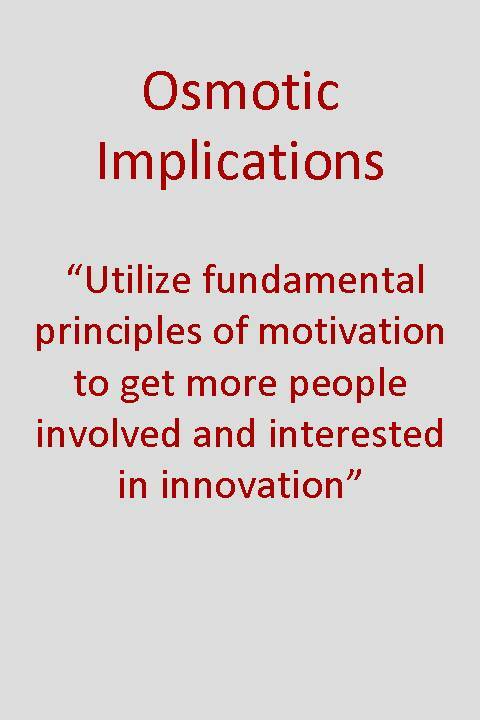 This entry was posted in Innovation incentives, Thinking and tagged Incentives, innovation session, Motivation, Rewards.